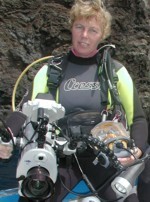 Publisher - Paul, a diver with some 2000 dives under his belt and over 30 years diving experience, a computer wizkid, TV Filmmaker, and computer business proprietor . Videographic Editor - Sheila, she mans (or should I say woman's the camera for Sky and Channel 5 News out in the Canaries), produces the short video clips in this magazine, keeps the accounts and hassles advertisers etc., Sheila has dived a bit - some 20 plus years, PADI Master Instructor, BSAC Advanced Instructor, Underwater Videographic Instructor, 4000 dives and then some and past Dive Centre Owner. Dave - Editor, 41 years diving, 26 years underwater photojournalist with 4000 plus dives, BSOUP Prize-winner, ex-diving tour operator manager and ex-marketing manager for one of the Worlds largest dive manufactures /distributors. Webmaster - Chris Punton, sets up and has designed the system so you can view the magazine online he also checks what you say - so any unauthorised advertising is deleted plus any undue expletives scrubbed - even mine! Two new faces join the staff of Holiday Diver June 2008 - In the position of Senior Journalist is Andy Clark who is a full-time Professional Police Diver. Andy is no stranger to journalism as he has written for both Scuba World and Dive Magazine over past years. As Andy likes nothing better than to grovel around the muddy bottom of the River Thames in zero-viz I am sure that I won´twant to disappoint him by sending him somewhere nice and warm with crystal clear water! Our other new appointment is Steve Oldale who takes over as Holiday Diver´s Advertising Manager. Steve has been diving for some 10 years, being a PADI Advanced Open Water Diver. Anyway that's the line-up and the team. We hope to give you something different and not just the usual ' that hotel was nice' when it was the pits; 'so an' so Airline really looked after me' even after one of the cabin crew threw dirty-ice-bucket-water over 4 passengers for a joke; or that piece of equipment was ' so good' even though we nearly died in trying to test it - its happened and you can read about it; Remember Good or Bad we will tell you about it.